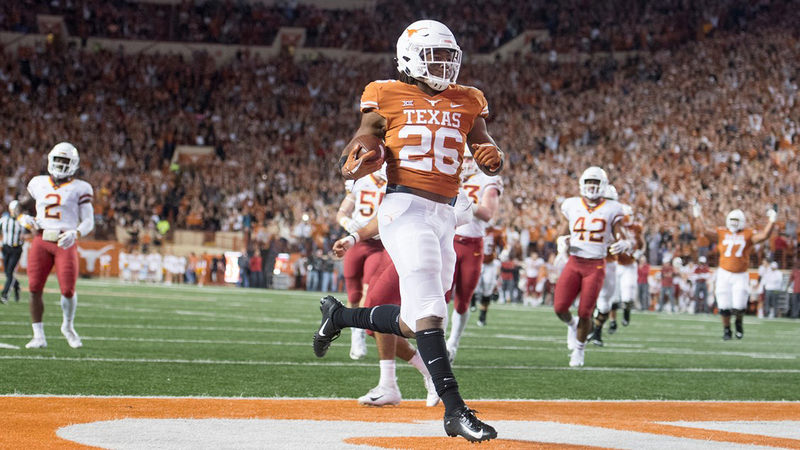 Texas head coach Tom Herman said running back Keontay Ingram is better suited to absorb the physical punishment of playing running back after adding 12-14 pounds of muscle over the offseason (photo courtesy of texassports.com). AUSTIN, Texas — The Texas Longhorns had good enthusiasm and relatively good execution when they returned to the practice field Monday after 10 days off for spring break, leading coach Tom Herman to remark about how his team has taken a “professional” approach to the workouts. The practice, just the Longhorns’ second of 11 in pads of the spring, left some players a “little rusty, a little gassed” from coming off a break with no football, Herman said, but that was to be expected. Part of the Longhorns’ focus comes from their success last season and the momentum that winning creates. A total buy-in from the players based on the “1-0 this week” mantra from Herman and his staff has a lot to do with it, as well. Despite last taking the field March 16 when Texas worked in pads for the first time this spring, there was no ill effect from the break, despite Herman's concern that there might be. Herman had to stop and think about who has stood out the most through the first four days of the spring, finally saying that sophomore running back Keaontay Ingram and redshirt freshman linebacker Ayodele Adeoye have caught the staff’s collective eye. The team wanted Ingram to add some weight in the offseason to better absorb the punishment he will take as a ballcarrier and as a pass protector. Adeoye, who suffered a knee injury in preseason practice last year, finally is making plays like he was expected to when he arrived. He only played in special teams last year, but will make a bid to be in the mix for the Longhorns’ middle linebacker spot in the fall. • Herman said sophomore safety B.J. Foster took a knee to the head near the end of Monday’s practice and will be evaluated. • Cornerback Anthony Cook and wide receivers Collin Johnson and Devin Devernay did individual work Monday, their first of the spring, and will do more as the practices go on with the hope of eventually being in team scrimmages.